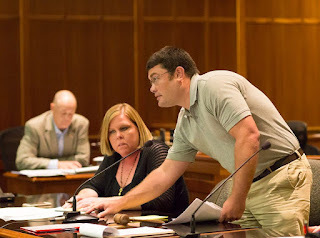 N&O government reporter Colin Campbell sent public records requests to staffers at all 100 county boards of elections in North Carolina, requesting "any email you, or anyone in your Board of Elections office, received from any Republican Party officials, including but not limited to, Dallas Woodhouse and Robin Hayes, in reference to early voting since July 25." Dallas Woodhouse is the Executive Director of the NC GOP and Robin Hayes is the Chair. Below are some updates our Executive Director, Dallas Woodhouse, has asked me to share with you. Hope you all are having a blessed Sunday! Please be aware of some important updates since my last email. I ask you to read it closely. Democrats are mobilizing for a fight over early voting locations and times. They are filling up election board meetings and demanding changes that are friendly to democrats and possibly voter fraud. Republicans should fight with all they have to promote safe and secure voting and for rules that are fair to our side. Democrats are mobilizing to fill this weeks board of election meetings. Past experience suggests these meetings will be loud and hostile. Our Republican Board members should feel empowered to make legal changes to early voting plans, that are supported by Republicans. We need to fully support our County BOE members as they make important decisions that follow the law and support republican positions. You're not voters to the NC GOP; you're possible cases of fraud. Not that there is actual fraud. That word is only, and forever has been, just a cover for "party line changes" (Dallas Woodhouse's words) to your right to vote and your ballot access. The fact that Woodhouse directed his message to BOE staffers, who are supposed to be non-partisan, should give every fair-minded citizen pause. Did the staff at the Watauga County Board of Elections receive this email? Did Bill Aceto and Nancy Owens? Not that they needed a memo from Dallas Woodhouse to screw with free and open elections.